Remember what it was like to play all the time? You could be a doctor, or a teacher, or cowboy, or anything you wanted to be. Play allows your child’s imagination to run wild, which is exactly what it should be doing, because playing is great for kids! So let’s break some common misconceptions about play. Play is beneficial to all children. So let’s break a few of these myths. Babies Don’t Play – Ok, now, I understand how some may think babies don’t play. They mostly just eat and sleep, but babies actually play a lot. 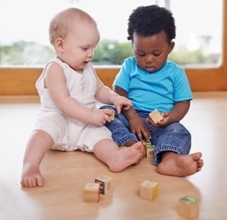 Play is how babies learn the most about their surroundings and how to communicate with others. This is when babies learn about cause and effect, like when a baby realizes that when they drop a ball, it falls to the ground. Babies also learn that something still exists even though they can’t see it. You don’t just disappear when you play peek-a-boo! 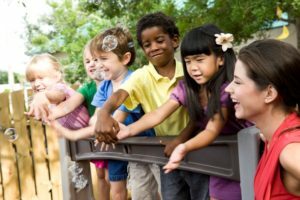 Play is Not Educational – Play is not the same type of learning from completing school work, but it’s just as important and still very educational. When children play, they expand their critical thinking skills while gaining the ability to adapt and be flexible. Think about when you’re on the playground, uh-oh, the ground is now hot lava? Quick, use the monkey bars! 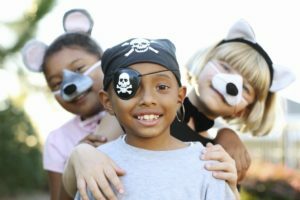 Toys are Needed for Play – Some toys have a specific way to which they need to be played, with little or no room for change, limiting a child’s imagination. The best way to battle these restrictive rules is to get toys with no rules. 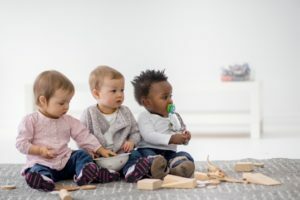 If someone if going to buy your child a toy, encourage items like dress up clothes, dolls, or stuffed animals, which allows your child to use their imagination while playing with them. This is the time where having no rules is actually encouraged! Play is so much more than you think and can provide your child with a foundation to help them master other skills later on in life. Playgrounds are a great place for your kid to explore, be creative, and engage in social activity. Here are some new ways to play at the playground. Helping your child retain learning over summer vacation is important. We have a great list of activities to prevent learning loss this summer.